if your content doesn’t stick and make an impact. Entrepreneurs – as well as all marketers – have been told that content marketing is the way to break through today – to win your prospects’ trust, to earn credibility and expert status and attract more sales. Well all that’s true. The problem is now in every niche there is a ton of content published every day. So your audience filters out most of it. You’ve got maybe a few seconds to get their initial attention. And then you have to keep earning their attention and interest throughout your content. You can lose it at any moment if your content doesn’t engage and hold their attention. Fact is, very little content sticks and makes an impact with your prospects. The businesses in your niche that do create content that sticks, surge ahead and have a massive advantage. [text_block style=”style_1.png” align=”left” font_size=”18″ font_color=”%23000″]So what’s the secret to making your content stick? That’s what my course – The Sticky Content Creation Crash Course – is about. It gathers scientific information from Stanford University and the University of Pennsylvania, as well as my experience of 30 years of creating content and copy for a wide range of clients. 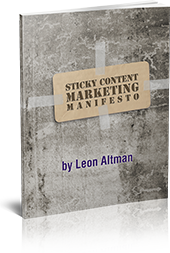 I’ve gathered the information and put together the ultimate crash course to learn how to make your content sticky. What kind of content am I talking about in this course? The principles of storytelling, structure, and metaphors work in just about any kind of content you use in your marketing. Blogs, articles, reports, white papers, videos, web pages, webinars, etc. Any content that is meant to engage, educate, inform. Education-based content is more critical to selling your products and services today than ever before. I’ve seen the growing importance of content marketing from the front lines. As a copywriter and, creative director for 30 years I’ve created campaigns for clients large and small. From IBM, Pfizer, Novartis, Citibank, Merrill Lynch, and Coldwell Banker to many small businesses and entrepreneurs. And much of what I’ve done over the past 15 years is integrate content into the sales process. For example: I was the one of the lead writers on creating the website for the launch iShares – one of the biggest financial launches ever. It was critical to create web pages that engaged investors and at the same time educate them in a simple straightforward about this new investment vehicle. “Learn from one of the best.” “I’ve worked with Leon on a myriad of projects in several different business niches throughout my career: Financial; Tech; Social; Retail; Real Estate. He’s also coached and mentored me along the way – always reminding me of the critical importance of “getting to the heart of your message” and doing so in a “compelling and interesting way”. Today, I’m the top marketing content guy and serial blogger for Cushman & Wakefield, Northern California, I have to say his advice, sagacity and talent have been priceless. You want to learn? Then learn from one of the best. “Leon was recommended to me by another business consultant. I started with his Sticky Content Creation Crash course which includes an excellent guide to using stories in copy. I highly recommend it. Following proven templates and structures make it easy to organize and create content that will stick. These templates will show you how to frame your content so it makes a stronger and lasting impact with your prospects. Action steps to so you are able to start using templates and structures for your own content. Fact is, I’m tired of entrepreneurs hearing about the benefits of content marketing and then spending a great deal of time and money with little results. Content marketing CAN be the most powrful force for vaulting you into expert status and building trust and credibility – but only if your content sticks and makes an impact. And I’ve seen too many hard working entrepreneurs lose out on the huge benefits of successful content. So I want to spread the word about STICKY content. And right now I’m making the course an absolute no-brainer for you . . . . The fee for this course is normally $197. However if you act now you can get it for only $97. [headline style="1" font_size="18" font_font="Source%20Sans%20Pro" font_style="normal" font_color="%23000" align="left" line_height="33" bottom_margin="30"]Fact is, I’m tired of entrepreneurs hearing about the benefits of content marketing and then spending a great deal of time and money with little results. I know that personal ATTENTION on content marketing can be the game changer. So for a limited time I’m offering a PRIVATE content marketing session. Get a 20 minute, one-on-one laser coaching session with me. Ask any content creation questions and let’s discuss how you can make an impact and attract more customers with your content. Since this is one on one I can only offer a limited number of sessions. So if you want to make sure you get this special bonus and this special price, just click below and order now. [headline style="1" font_size="18" font_font="Source%20Sans%20Pro" font_style="normal" font_color="%23000" align="left" line_height="33" bottom_margin="30"]I know that personal ATTENTION on content marketing can be the game changer. So for a limited time I’m offering a PRIVATE content marketing session.